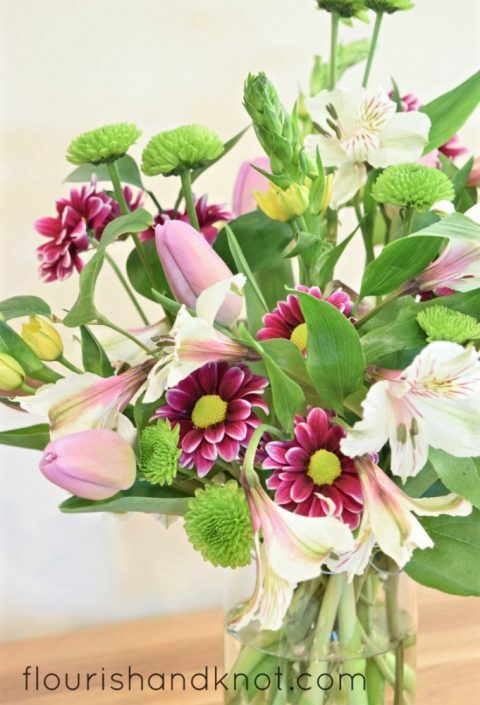 If you are looking for more floral inspiration, you can find my portfolio HERE. 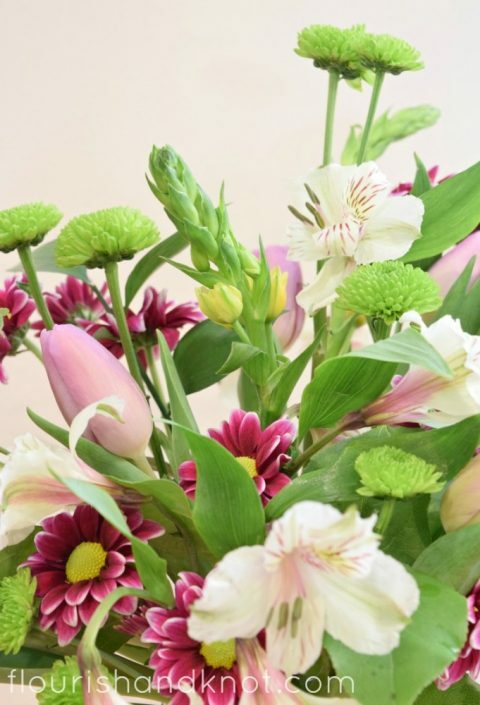 This arranging style doesn’t use any of the toxic floral foam (like Oasis) that is so common in the floral industry. Floral foam is really useful in certain situations (if you have to move your arrangement – like for a wedding – or if you want it to last for ages without needing to change water – like if you send flowers to a hospital or retirement home), but it certainly isn’t the best option, environmentally-speaking. 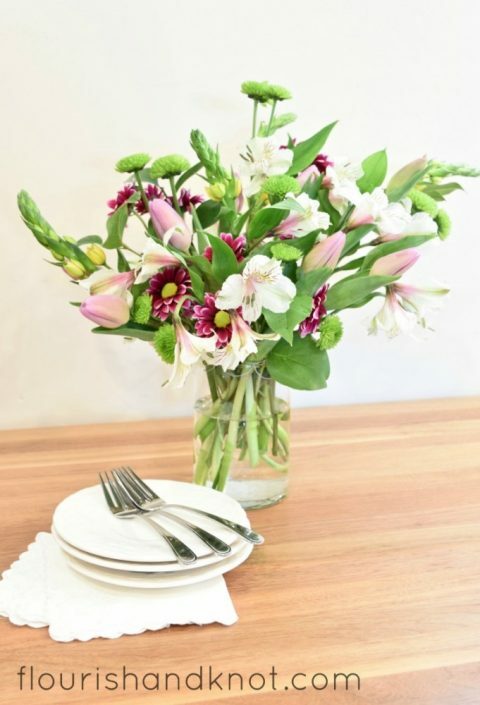 Let’s create a beautiful spring floral arrangement to get your table all set for guests! 2. Working asymmetrically, create a foundation of greenery. 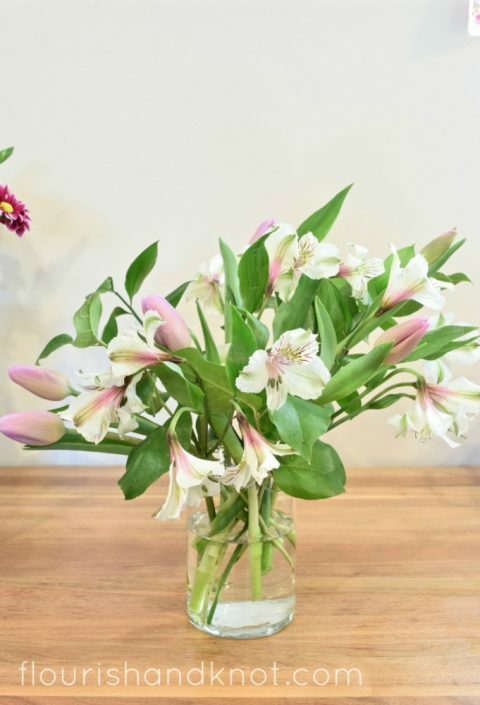 I arranged my flowers in a loose triangle, with taller blooms to the right and shorter to the left. 3. 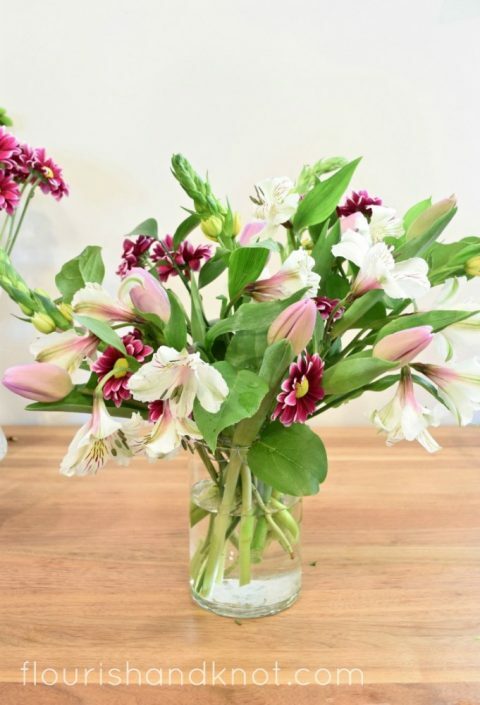 Add the alstroemeria, again working with taller stems on the right and shorter to the left, to create asymmetry. 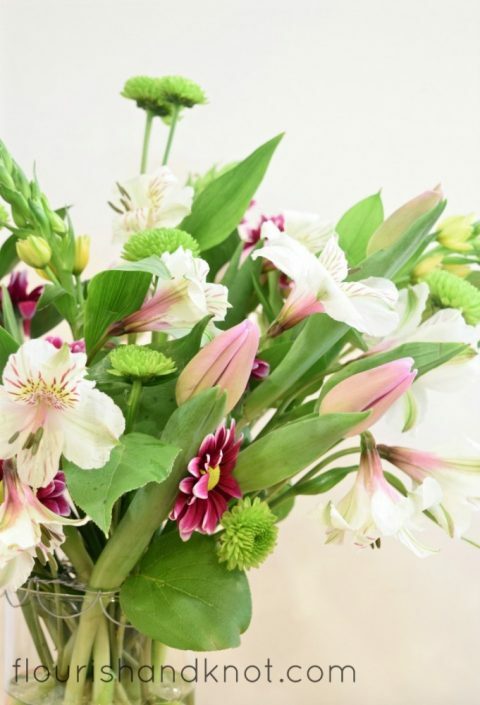 You could substitute the alstroemeria with another loose spray-type flower. 5. Add you contrasting filler; in my case, the purple and white variegated mums. 6. Add your spiky blooms; in my case, I used the ornito. A good substitute would be snapdragons, delphinium, astilbe, or statice. 7. Add your “fun” filler; I used the green button mums. These shouldn’t be nestled too closely – you want some whimsy! 8. 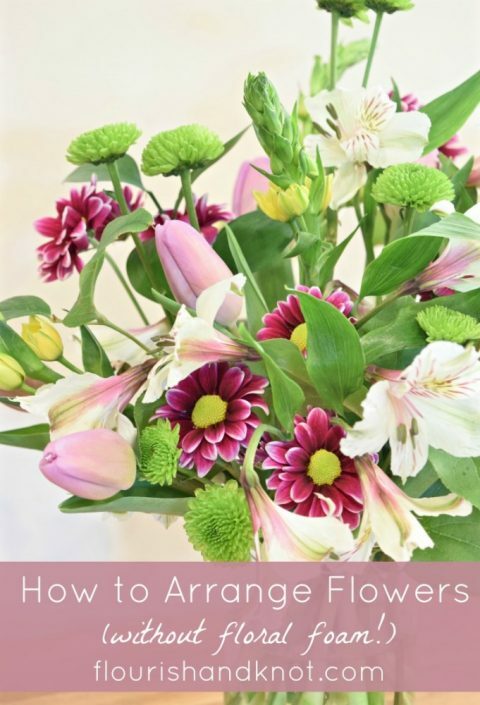 Play around with the placement of your flowers, but… you’re done! 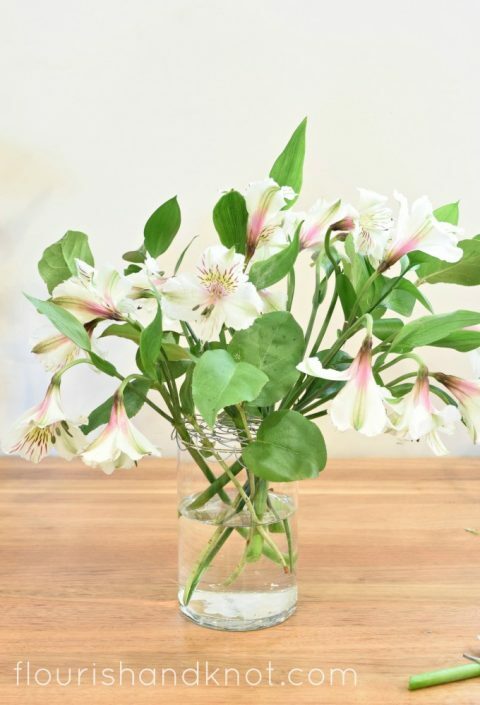 If you want to adjust a flower, make sure to hold down your grid! 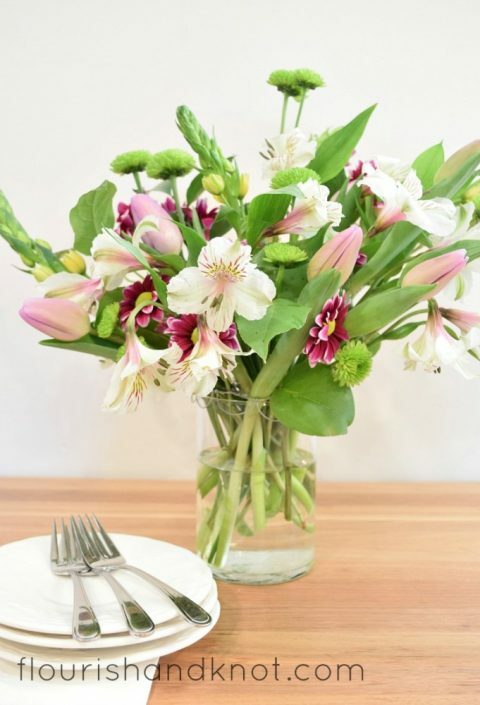 This would be a great centrepiece for an Easter table (and you can pick up a nice bouquet at most grocery stores! ), or for a spring lunch or event. 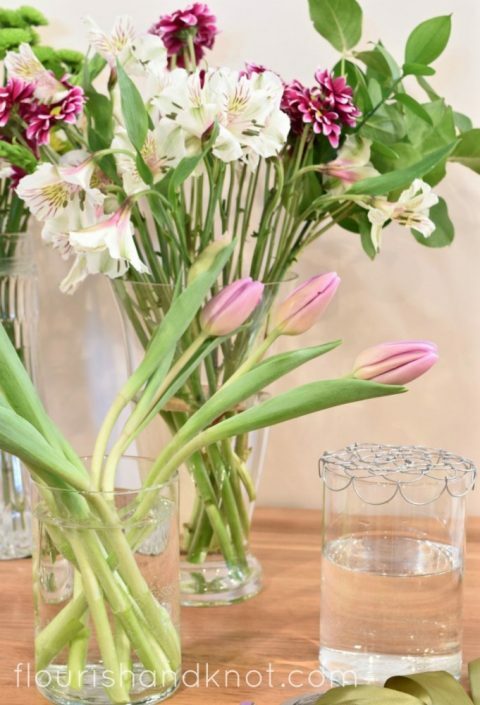 A beautiful floral arrangement adds some elegance and charm to even the simplest affair. It really shows people that you took care, and makes your guests feel appreciated. 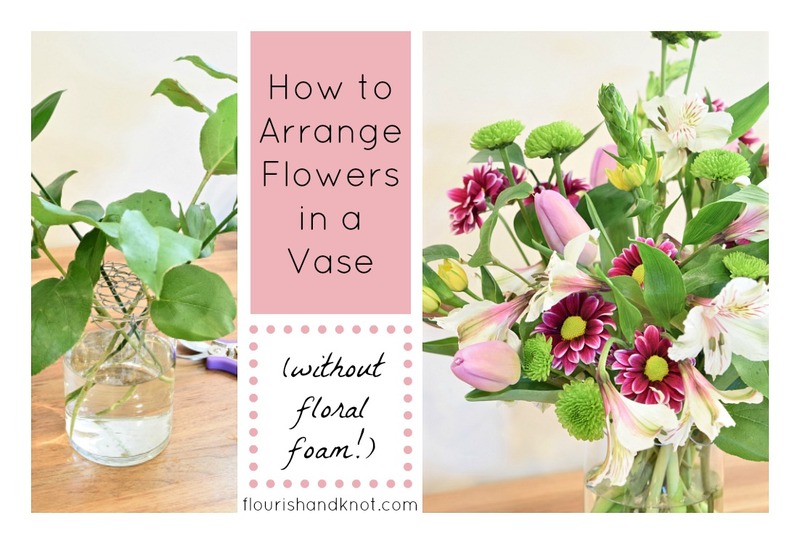 If you are looking for another easy, no-floral-foam DIY arrangement, you can see all of my tutorials here! 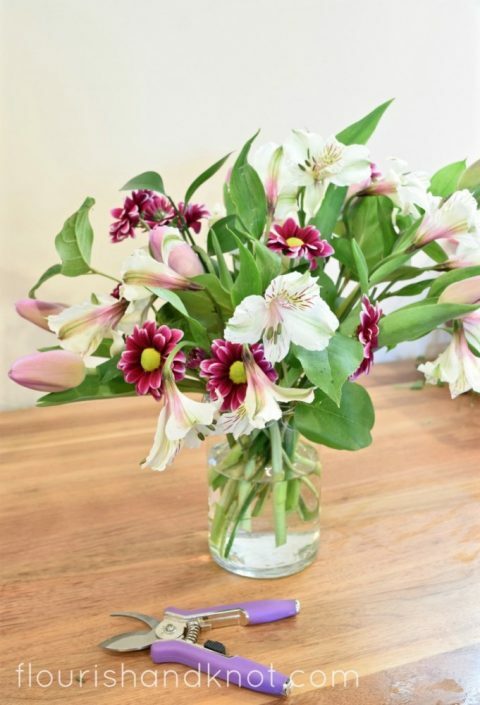 If you’d like to learn how to make a simple floral arrangement or bouquet like this in the company of your friends or family, I can help! Click here to find out more about my creative craft and DIY parties and workshops! 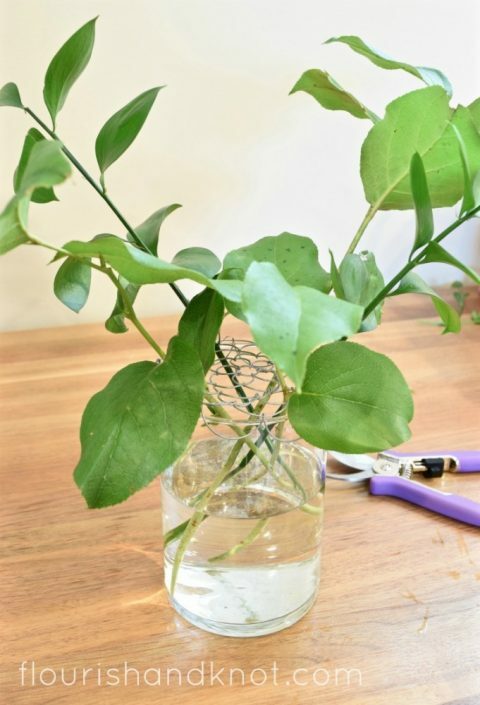 If you are planning a DIY wedding or special event, and need a little guidance (or perhaps even a hands-on tutorial in, say, creating your own florals? ), I can help you out. Click here to read more about my DIY Event Consultation services! I want to take this opportunity to wish you a joyful Easter and Passover, and a glorious spring in general! We are FINALLY getting some really lovely weather, and I have delusions hopes of getting into my garden soon. What are you up to this weekend?